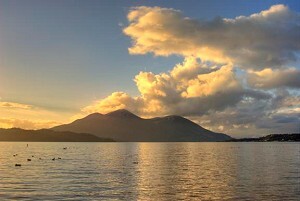 Former volcano Mount Konocti overlooks Clear Lake. Photo courtesy Stephen Nakatami of Flickr under Creative Commons license; all other photos by Andrew Alden. The Bay Area has been very familiar with earthquakes for at least 20 million years. Volcanoes might seem more remote, but their traces can be seen in many places. Lava flows and ashfall beds are widespread in our rocks, marking the progress of an ancient volcanic center through the area. And while the nearest active volcanoes are beyond the Sierra Nevada, they’re close enough to keep an eye on. California has three major sources of volcanism and one minor one. The minor one is what we have in the Bay Area, but let me mention the others first. The classic type of California volcanism arises from subduction. This diagram shows how it looks for northernmost California today, with an oceanic plate traveling beneath North America. Water and sediment on top of the downgoing plate acts like a flux, promoting melting in the overlying plate. That’s how volcanoes are produced all around the Pacific “ring of fire,” and all of California used to look that way. Today the Cascade Range volcanoes are produced by this mechanism. California members of the Cascades include Mount Lassen, which last erupted in 1917, and Mount Shasta, which may have erupted in the 1700s. South of that, this system was interrupted when the San Andreas fault system formed and began extending northward (now the boundary between the two tectonic regimes is a triple junction at Cape Mendocino). 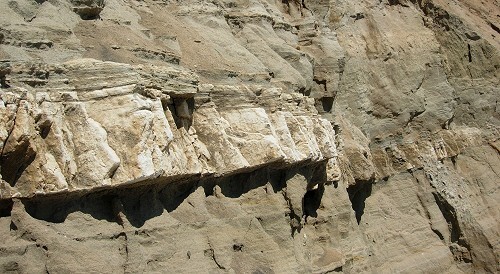 An example of Cascade volcanic deposits crops out south of Ocean Beach near San Francisco, a prominent ash bed in the seacliffs of the Merced Formation. It’s known as the Rockland ash and came from an ancestor of Lassen volcano, called Mount Tehama, about 600,000 years ago. The second major kind of California volcanism is beyond the Sierra, in the Mammoth Lakes area and points south. The last “supervolcano” eruption from that area was about 700,000 years ago, and ash from it (the Bishop Tuff) fell here although I don’t know where to point you to it. That volcanism is related to stretching of the crust in the Basin and Range province, which basically includes all of Nevada and surrounding counties. The third type of volcanism is related to Yellowstone, of all places. The geysers and lava flows of Yellowstone are the current location of an eruptive center that began about 16 million years ago in Oregon and slowly burned its way eastward across Idaho, leaving enormous plains of solid lava behind. Northeastern California has a lot of it. One of the first eruptions in that series came from California, sending a glowing flood of basalt lava our way. It flowed more than 200 kilometers as far as Vacaville, where it’s mapped as the Putnam Peak Basalt. Boulders of basalt akin to that in Yellowstone and Idaho lie west of Winters. You can inspect this rock at leisure on Route 128 west of Winters, about 2 miles west of Pleasants Valley Road. It’s the location given at the top of this post. OK, on to our own local volcanism. As the San Andreas fault system cut northward through our region, it cut off the preexisting subducting plate like a letter opener slicing across an envelope. The plate continued to descend, leaving behind it a traveling “slab window” that briefly allowed the hot underlying rocks of the Earth’s mantle to send up magma. In the Bay Area, slab-window volcanic rocks came in three pulses. 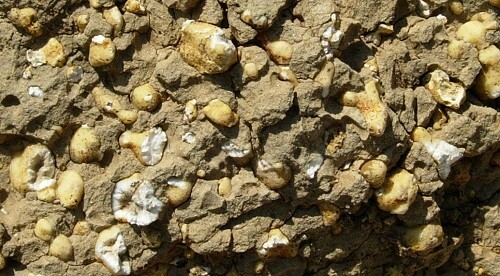 The first pulse dates from 11 to 8.5 million years ago. 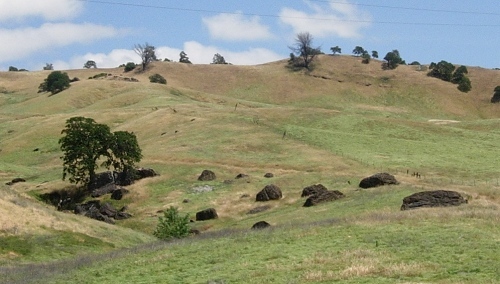 Its lavas have been dismembered by motion along the San Andreas and related faults, and now it occurs east of Hollister (the Quien Sabe Volcanics), in the East Bay Hills (well exposed in Sibley Volcanic Regional Preserve), at Burdell Mountain in Marin County, and the Tolay Volcanics between Petaluma and Santa Rosa. The next pulse of slab-window volcanism produced the large Sonoma Volcanics between 8 and 2.5 million years ago. 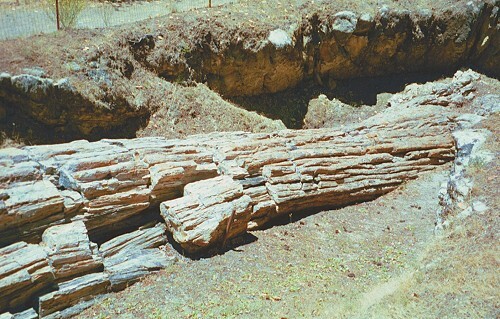 A good place to see these is at the Petrified Forest park west of Calistoga, where whole redwood trunks have been fossilized in the silica-rich ash. Since then, slab-window volcanism has migrated north to the Clear Lake/Geysers region. Mount Konocti, overlooking the lake, is a recent volcanic construction. The famous hot springs get their heat from this volcanism. And the huge geothermal power complex at The Geysers, based on natural steam heated by underlying magma, supplies electricity to the Bay Area, helping you read this story. Can’t stop reading all this info. I was raised in S.F. and never knew all this history. Great read! I grew up in the shadows of Mt. Shasta and Mt. Lassen, and have always wanted to be there when one of them awakens. Mt. Lassen they say, is overdue. My daughter lives near San Louis Obispo, and after driving out to Morrow Rock on the man made roadway, I went home and googled it to see why it is even there. Continued…..Morrow Rock as it turns out, is all that is left of an ancient plug dome volcano that erupted when that section(West of the San Andreas fault)was down where Cabo is today. Fascinating stuff! Prev Google Code Jam 2011 Starts May 6th Next Will Conventional Produce Lower Your Child's IQ?